Tom Filsinger Will be at Cab Comics in Flagstaff for Tabletop Game Day! What better way to learn how to play a game than from the creator himself! Tom Filsinger will be at Cab Comics in Flagstaff, Arizona on Tabletop Game Day on April 30. He will be running game demos from 11:00 – 3:00. Tabletop Game Day is a big day for Filsinger Games. There will be game events throughout the United States including Los Angeles, Pittsburgh, Omaha, and New Haven. 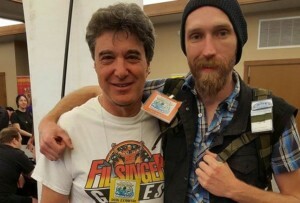 Filsinger Games fans will be communicating via Twitter, Facebook, and other social networks. DON’T MISS OUT! JOIN US AND HELP SPREAD FILSINGER GAMES MADNESS TO THE MASSES! For more about Filsinger Games events for Tabletop Game Day go here. Above photo is from Verde Valley Comic Con on April 9. Tom with Arizona game master, the Chief. ← Ace Arcadium Promises to Set the High Score in Your 8MW Fed!